Why would you go there? There are mountains in Bulgaria? These are the kind of questions our friends and family would ask us before we actually got to Bulgaria. It seems that to a lot of people that travel to Bulgaria are either adventurers discovering off-the beaten-path destinations, digital nomads or travelers that do the Schengen Visa run. No matter why they are coming in the first place most of them leave Bulgaria with amazing feedback. And to be honest, there is no reason to not love it! It is relatively cheap place to travel to, people are extremely hospitable and it has a lot of fun activities to offer. In addition I know plenty of travel bloggers who’ve been here, it still seems like an undiscovered travel spot for most. All in all adventure & fund for little money. First stop in Bulgaria was the capital Sofia. Sofia is a great and hip city with plenty of cool places and restaurants to discover. Unfortunately we only stayed for 2 days and then head off to Bansko, our home for the next 6 weeks. Even though the short sty, we still managed get a good impression of the city (check out this post with the top 10 things to do in Sofia). We took the public bus from Sofia to Bansko which made us realize how spread out the city actually is. You definitely get a feel for the 1.2 million inhabitants of Sofia by then. The drive took about 2.5 hours through windy roads and snow covered mountains. Dave and I are were in heaven. At that point neither of us had seen snow for at least 5 years. After arriving in Bansko, we couldn't wait to get out of the bus walk through the snow. It was certainly a great feeling to hear the snow crunching under our feet. We’ve instantly had a good feeling about Bansko. The villages residents seemed very content, glad to live a very rural, community-based life in the Bulgarian countryside. It was nice to see such simplicity—a welcome break from the hustle and bustle of big cities. Yes, remote Bulgaria is a wonderful spot to get away from it all. Above all Bansko is a really lovely town. Out the window we could see the sun rising and setting over the mountains, showing it’s most beautiful colors. When we went for a walk, stray dogs followed us in hope to get attention and a little pet. Everything was within walking distance, supermarket, gym, co-working office and most importantly the Gondola. 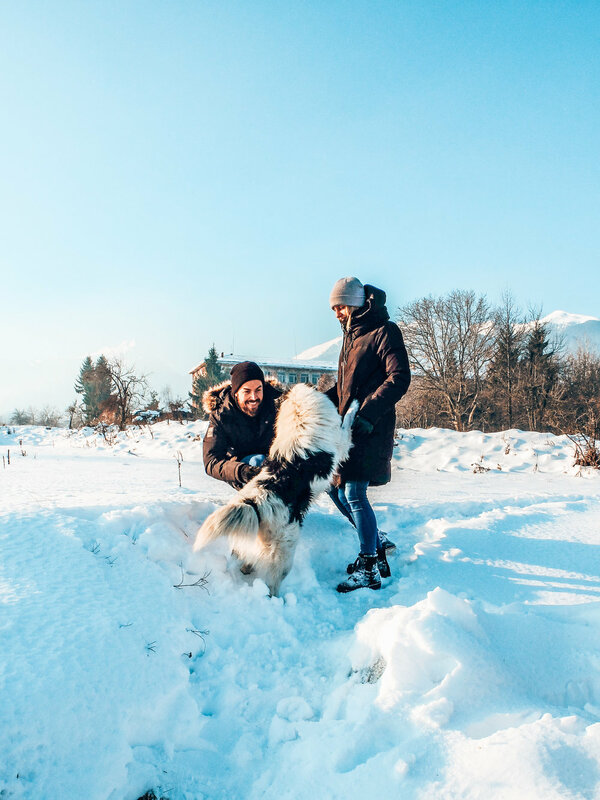 Adventure is one of our main criteria to choose places (check out our 20 adventures for couples) and Bansko did not disappoint us! In other words it was definitely an experience we haven’t had so far, and we were ultimately glad we started our year 2019 there. Let’s get to the most important part of ALL. Living Expenses. For all digital nomads that’s a big one, simply because no one wants to live in a country or city where you feel you can’t afford anything or enjoy yourself. Therefor we put together a little list of what our costs come to during our stay. If you’ve experienced any different or have any questions, please feel free to shoot us a message. 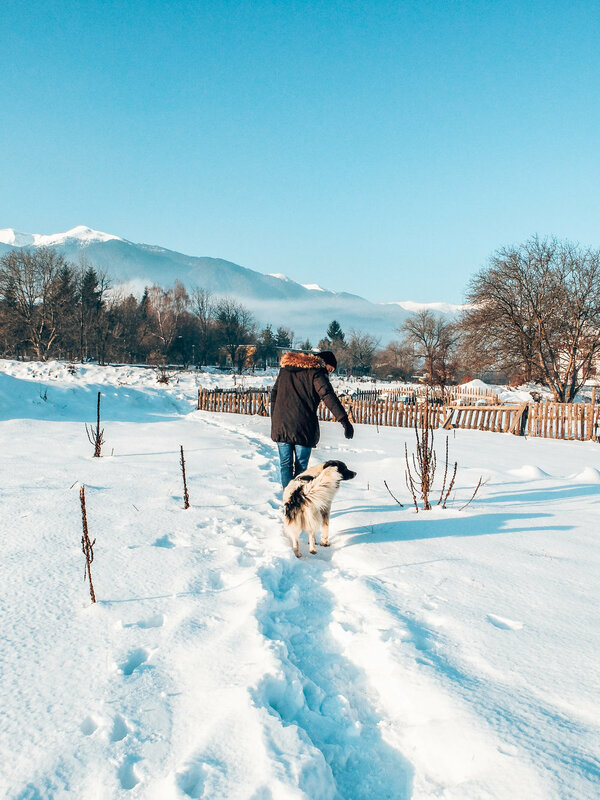 Even if you aren’t earning a killing just yet, Bansko is a great option for digital nomads that are just starting out. You can easily survive of smaller jobs as your monthly costs are very moderate especially for a ski resort. Before I go, I want to invite you to join my email list community. By signing up (it’s free), you’ll get access to my Digital Resource Library with free downloads, like travel cheatsheets, e-books, and more. I'm into it! Sign me up! Yeeew I wanna join the tribe! Thank you! You’re on the way to become a FULL TIME adventure traveler. We’ll send you all our hacks, how we made it happen!